No-one would seriously disagree that art is political. As you wander around the streets of any city, the art and architecture will give a powerful message about the last regime to hold real power in that place. Nelson’s column and the bronze lions of Britannia in London’s Trafalgar Square remind us of the once-powerful empire and the feeling of superiority which still infuse the city and its leaders. The People’s Palace in Bucharest and the surrounding boulevards are a lasting monument to the destructive power of communist president Nicolae Ceausescu, who ordered the razing of the surrounding churches and apartments in order to create a capital city which spoke of the unassailable power of the communist regime. Similarly, the streets and piazzas of Florence are filled with marble and bronze statues preserving the legacy of the Medici dynasty, who ruled the city for nearly four centuries. The People’s Palace, Bucharest, Romania. All influential people, from despotic dictators to advertising executives, know that their message and ideals can be hidden in the arts. As we are entertained and enthralled, our inbuilt cynicism and resistance can be circumvented and we imbibe the message with the medium. Often the ideas and theories which start circulating among academics, are picked up and popularised by the arts. Even abstract art which claims to be devoid of all meaning carries with it the unsubtle message of postmodernism, that all objective meaning is elusive. So what should any self-respecting dictator, despot, Pope or CEO do upon seizing power? The obvious answer is to stamp their authority on the arts and the resulting iconoclasm can be very hard to stomach. In 2001 the Taliban destroyed two enormous statues of the Buddha, carved into a cliff in Afghanistan in the 6th Century, having declared them as idols and not permitted by under their extreme form of Islamic law. The niches where the statues stood can be seen towering above the Bamiyan Valley, which was added to UNESCO’s list of world heritage in danger in 2003. In a similar way the French Revolutionaries of the 18th Century took pains to decapitate the statues of bishops and kings that adorned their cathedrals and basilicas. Further back in history, in Florence in 1497, the followers of the preacher Girolamo Savonarola set fire to many works of art and books in what became know as The Bonfire of the Vanities. The art historian of the period, Giorgio Vasari reports that Botticelli was a follower of Savonarolo and may have put some of his own painting onto the pyre. It is certainly clear that Botticelli’s exuberant style become more muted in works painted after this event. But as we begin to tut under our breath at the waste and the cultural barbarism, we might recall our reaction to this images on the news. 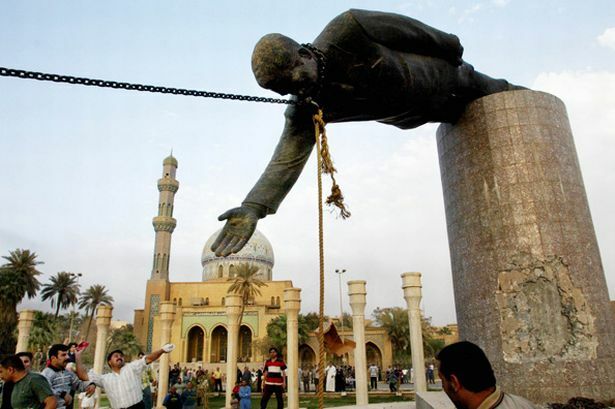 US soldiers and Iraqi citizens topple a statue of Saddam Hussein in 2003. Dictator Chic has not always been tacky statues and brutalist concrete palaces – what we celebrate in Florence is no less the result of a dynasty intent on displaying its dominance through the arts. The principal difference, it seems, between artistic iconoclasm that attracts our ire and that which gains our approval is the tricky matter of personal taste. Did we like what was pulled down? An alternative approach to iconoclasm is to change the message without destroying the medium, as the citizens of Florence did in 1494 after the expulsion of the Medici family. In the 1460s the sculptor Donatello had made a pair of bronze sculptures from biblical stories which would stand in the private garden of the Medici Palace in Florence. One was of David, the shepherd boy from Bethlehem standing nonchalantly above the severed head of the giant Goliath. The other was a more visceral and disturbing scene as the apocryphal Jewish heroine Judith raises a sword to deliver a fatal blow to the neck of Holofernes, the general of the mighty Assyrian Army. In keeping with much of the art of the period and with the narrative of the scene, this sculpture group is infused sexual intensity. The account in the Jewish Apocrypha records that Judith, a noble widow among the Jewish people had entered the Assyrian commander’s camp and surrendered to him. On the night she will murder him we read that “Holofernes’ heart was ravished with her and his passion was aroused, for he had been waiting for an opportunity to seduce her from the day he first saw her” (Judith 12:16). To this end they drink and feast together until Holofernes had “drank a great quantity of wine, much more than he had ever drunk in any one day since he was born.” (v20). Later that night, as Holofernes lies unconscious on his bed, Judith reaches for his own sword and, in two strokes, hacks his head from his half-naked body. She then runs into the night having saved her city from the marauding army marshalled outside its gate. Donatello has chosen to evoke that particular moment between blows, as Judith holds up Holofernes by the hair, raises the sword above her head and prays for strength as she completes her deadly mission. Despite his desires, Holofernes is impotent to resist and, as if to emphasise his incapacity, Judith’s foot presses down on Holofernes’ limp and useless sword hand. When the Medici family were expelled from the city in 1494, the statue was taken down but, far from being destroyed, it was set up on the steps of the Palazzo Vecchio, the Florentine town hall in the central Piazza della Signoria. Removed from the garden pedestal with its inscription, the Florentines were ready to reclaim this delicate work of art and imbue it with a new meaning. The new (and slightly mismatched looking) column upon which the work still stands reads “The Citizens set up this exemplar for the welfare of the public, 1495”. (Testa, p85). This reminder of a virtuous city throwing off the tyranny of a powerful and ruthless ruler, now stood to celebrate the victory of the Florentine citizens as they saw off the overbearing Medici. The group has since been moved one more time, in 1504. It was shifted into a less prominent position ten meters to the left, displaced by the more masculine edifice of Michelangelo’s David. This seemingly small act of jostling the position of the art works in the square reflected another change in the perceived message of the sculpture group. By 1504, observers could no longer see political overtones, seeing instead the fearful prospect of a man at the mercy of a woman intent on murder. By moving it to a less prominent location, the group would be preserved, but overshadowed by David, a statue which was considered to be more appropriate than one where a woman held such control over a man. Detail from the replica of Michaelangelo’s marble sculpture David (Il Gigante) located at the entrance to the Palazzo Vecchio in the Piazza della Signoria, Florence Italy. If there is a lesson for the artist in all of this it is surely that art with a degree of ambiguity has a better chance of surviving the winds of political change. If there is an opportunity to read different meanings into a work, then everyone can claim your art carries their message. But is such ambiguity an abdication of responsibility? Should artists be content to let their work be appropriated and defined by their patron, or by any subsequent owners? Can art really be said to be political if its meaning can be modified to suit the whims of the viewing public? If we are comfortable with the paradigm that the ultimate act of artistic expression was the creation of the universe, then there is comfort to be drawn from God’s infinitely complex sculpture group. Creation is embedded with a message and in Psalm 19, a song written by David and almost certainly sung regularly by Judith, we read that their purpose is to reveal their creator. In terms of communication, however, the world is impressionist at best, and people are free to suffuse it with their own meaning or even to see it as a pure abstract. If we want to understand the message we need to accept the artists’ description, but if God seems content to allow such a degree of ambiguity in his art, then we could be content to let others interpret our work, whether we meant it to be political or not. An Art Lover’s Guide to Florence (Judith Testa, 2012, NUI Press) is available in the UK from Amazon via this Affiliate Link. This entry was posted in Art, Culture, Sabbatical by Jon. Bookmark the permalink.